Flat-Bar Road Bicycles have most of the advantages of regular road bikes--lightweight frames and relatively narrow tires for efficiency on pavement--with a flat or upright handlebar. These bikes are designed for people who want a light, high-performance bike, but don't like the drop-handlebar riding position of a regular road bike. These bicycles are sometimes called fitness bikes or performance hybrid bikes. Most of them can accept somewhat wider tires, to make them suitable for use on unpaved trails. They also have the ability to mount cargo racks and fenders, which make them good commuter bikes. We carry Trek's FX series of fitness hybrids in various performance levels in both men's and women's fits. Dual Sport bikes blend the fit and agility of a fitness hybrid with the function and stability of a mountain bike to result in the ideal bike for cruising dirt roads and gravel paths. We carry the Trek DS series for men's sizing, and the Trek Neko for women's sizing. Comfort hybrids prioritize rider comfort over all else. These bikes have wide, cushy saddles and an upright riding position. Many of these bikes sport a step-through frame to make it easier to mount and dismount the bike. We carry the Trek Verve and Shift ranges in both men's and women's sizing. Townies take the general concept of comfort hybrids and infuse them with the style of classic cruiser bikes. These bikes are fun, stylish, and comfortable. They also feature a special flat-foot design that allows the rider to rest with both feet flat on the ground while maintaining proper leg extension for pedaling, making these some of the most stable bikes in our lineup. We carry Electra Townies in 3 speed, 7 speed, and 21 speed varieties in both men's and women's sizing. 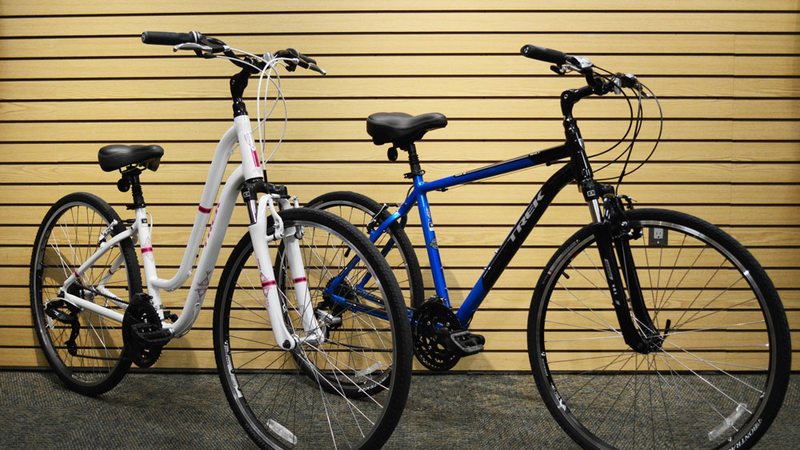 Click on the links to the left to learn more about the bikes we carry. As always, feel free to come by and test ride any bikes that you are interested in. Got questions? Call or email us.